When I think back to my fondest childhood memories I without a doubt find myself sitting on a dock in Muskoka. I’ve spent my entire life enjoying a powerful connection to Ontario’s Cottage Country, with many of my parents earliest family videos and pictures having been shot on my grandparents cottage dock on Mary Lake just outside of Huntsville. I remember spending hours swimming in the lake with partner in crime Meadow (my energetic Golden Retriever), perfecting my waterski pose, canoeing for wild blueberries and reading through thrillers by Michael Crichton and Hardy Boys mysteries for hours on end. Like so many Canadian families, most of our summer feasts revolved around the BBQ. My mother had a penchant for delaying dinner (in the city we’d typically eat at 6pm during the school year) but in the summer up at our cottage we’d “eat like Europeans” sometimes after 8pm, ultimately whenever the crimson sunset had splashed across the horizon and our tummies began to grumble. I’ve been munching on Bick’s pickles at the cottage since I was a wee one: my dad likes to pair the sweet bread and butter variety with his famous Grilled Cheese Sandwiches while my mother prefers a garlic infused whole baby cucumber that she can get her hands on and crunch through. This summer I worked with the team at Bick’s to inspire Canadians to get creative at the BBQ. I spent my weekend at a beautiful cottage on Silver Lake near Parry Sound with ten friends (who I dubbed the Bick’s Pickle Food Squad). We enjoyed an outrageously fun weekend which will undoubtedly be remembered as a series of joyous, never-ending, pickle-centric dinner parties. My menu pays homage to my cottage loving childhood while also exploring some of my favourite grown up taste-spirations. As I served up each feast at the cottage I learned one thing: whatever your taste preference, there’s a Bick’s pickle for everyone. Whether it’s sweet, spicy, tangy dill or loaded with garlic, there’s a pickle to compliment any delicious flavour combination. This summer Bick’s is hosting a contest that challenges Canadians to find “lost burgers” and reunite them with a Bick’s pickle, for a chance to win a Big Green Egg BBQ. They’ll be giving away one BBQ every week this summer! You can find your BBQ inspiration this season via Bick’s Lost Burger recipes, a colourful collection of pickle-centric inspirations featuring creative concoctions such as Lost in the Jungle Burger (grilled chicken breast, Bick’s Hot Pepper Relish, Bick’s Mini Crunch’ems, red onion, mayo, Bick’s Hot Pepper Rings, mango slices, salad greens) and the flamboyantly decadent Lost at the Opera Burger (beef patty, Bick’s Cocktail Onion, succulent lobster tail, foie gras). 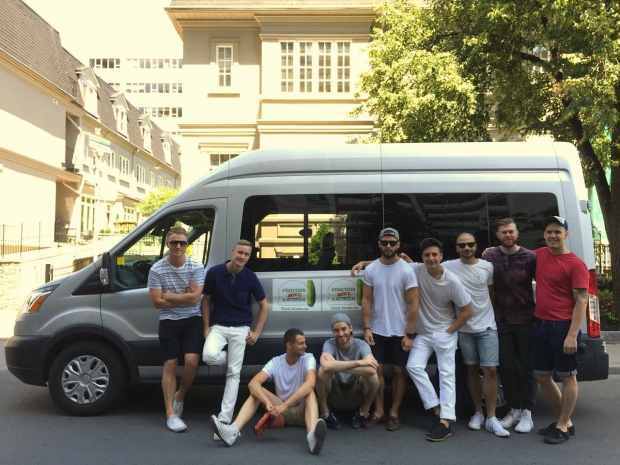 If your hosting a gang of ten why worry about gas money, car insurance and heaven forbid getting lost on the highway when you can simply hire a car service to zoom you to and fro. We headed up north on a Friday at noon arriving to the cottage just before the dinner hour with four hours of sun to spare! On Sunday we relaxed by the lake all day before we were picked up at 7pm for a short drive back to the city. Be sure to plan your adventure so you can maximize time with friends and reduce the chances that you’ll get stuck in traffic. 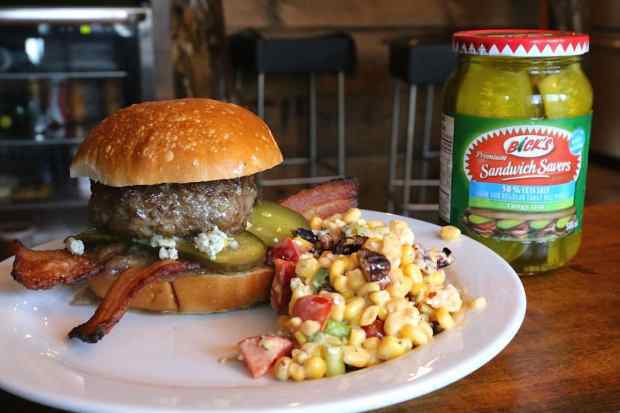 Anyone from Toronto who has had the opportunity to enjoy Muskoka as a second home will be fondly familiar with iconic flame-grilled burger restaurant Webers which is located on Highway 11 in Orillia. 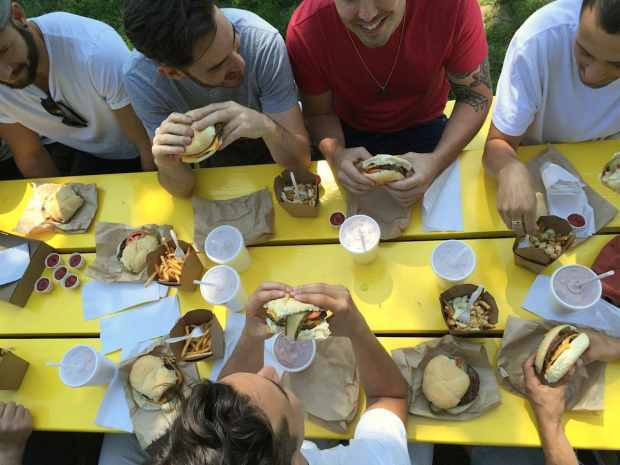 For children who have been sitting in a car for hours on end, Webers is an oasis where milkshakes, juicy burgers and stringy poutine force a smug smile. Parents of course enjoy the stop as it’s half way to the cottage and a great way to stretch your legs and grab a snack en route. The restaurant regularly features a line which snakes out the front doors and across gravel parking lot. Hungry guests can enjoy their burgers in the comfort of a vintage train or skip out back to a leafy park where colourful picnic tables sit in the sun begging for you to enjoy an al fresco feast. In order to host an ultimate cottage weekend one must first find a cottage! Muskoka is Ontario’s most adored lake district and properties sell out months in advance so plan ahead! My parents have been renting a cottage now for over 10 years and typically book their accommodation shortly after Christmas. The best resources for finding a top notch cottage in Muskoka are Cottage Life, the Ontario Tourism App and Airbnb. We stayed at a spacious five bedroom cottage perched over Silver Lake a stones throw from Parry Sound and Lake Joseph. Make sure to double check your property has easy lakeside access and an open concept kitchen so you can socialize as you prepare each feast for your guests. After spending the afternoon driving up to cottage country I wanted to ensure our first feast was easy to prepare and put together so I could maximize my time with guests before the sun set. 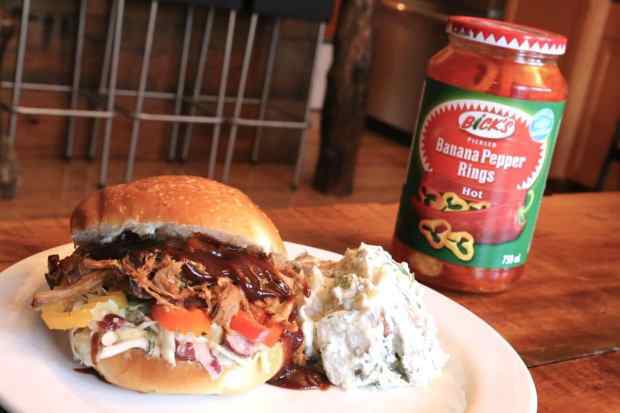 Pulled Pork Sandwiches are always a crowd pleaser and in this rendition I stuffed a soft bun with crunchy coleslaw, a generous portion of pulled pork, smokey BBQ sauce and spicy Bick’s Banana Pepper Rings. Each bite was complimented by a freshly prepared potato salad featuring fresh green onions, dill, lemon, sour cream and diced Bick’s Sandwich Savers. Each morning as soon as I woke up I’d dash down to the kitchen and prepare a pot of coffee. The aroma of freshly brewed Folger’s coffee is swoon worthy and moments later I’d find half awake friends stumbling towards the dinning room table. 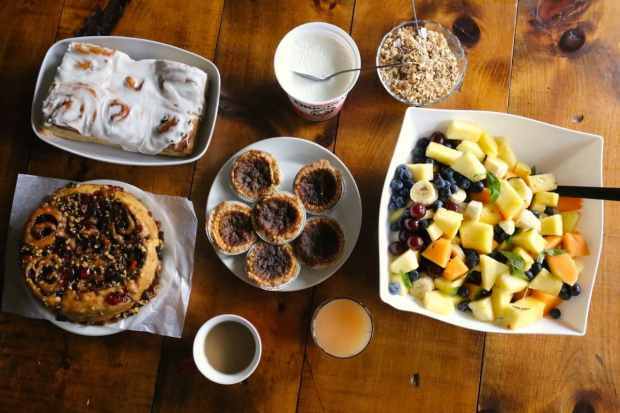 My breakfast spread featured a massive bowl of fresh fruit salad (pineapple, melon, banana, blueberries, grapes, mint), grapefruit juice, coffee, greek yogurt with granola, cinnamon buns, cranberry butter tarts and sweet and sticky chelsea buns. After spending all morning hiking through the forest and paddling across the lake we all gathered back at the cottage for a snack-worthy lunch featuring a decadent cheese and charcuterie offering. Pile a plate with a selection of your favourite artisinal crackers, pop open two jars of chutney/jelly and gently decorate a serving platter with a selection of top notch fromage (Wensleydale Creamery Abbot’s Gold English with Caramelized Onions, Gruyere, Mimolette, Manchego, St Andre Triple Cream) and trilogy of charcuterie (sopressata, prosciutto, salami). 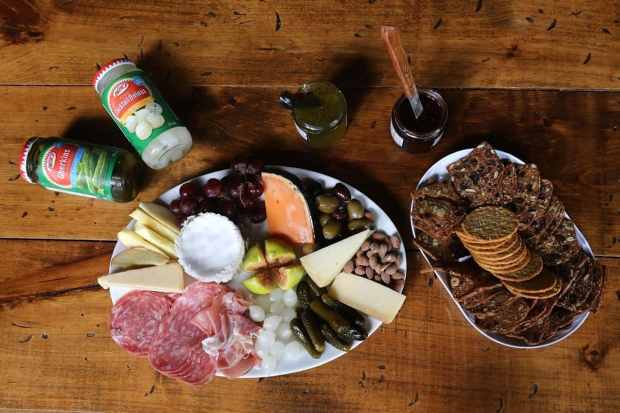 Fill the plate with sliced apples, grapes, mixed olives, smoked almonds, fresh fig and Bick’s Cocktail Onions + Gherkins for the ultimate pickled crunch. Burgers at the cottage are “a thing,” and I wanted to ensure I created a decadent offering that would make eyes bulge and arteries quiver. You can watch each step of the burgers prep in the video above which features honey mustard and garlic aioli slathered bun, caramelized onions, crispy bacon, blue cheese, Bick’s Sandwich Savers and a plump burger first fried in bacon fat and then finished off in the oven to ensure maximum moisture. The ultimate burger was accompanied by a fresh cajun corn salad which featured sweet red pepper, jalapeno pepper, scallion, lime, sour cream, cherry tomatoes, roasted pecans and crumbled feta. Our afternoons featured a delightful heat wave perfect for enjoying Muskoka’s natural beauty. Over the course of our weekend we enjoyed hiking through the forest, dockside catwalk, kayaking across the lake, diving into the deep and tanning on a sun-soaked rock. Be sure to mix and mingle spurts of energy with moments of complete relaxation for ultimate satisfaction. 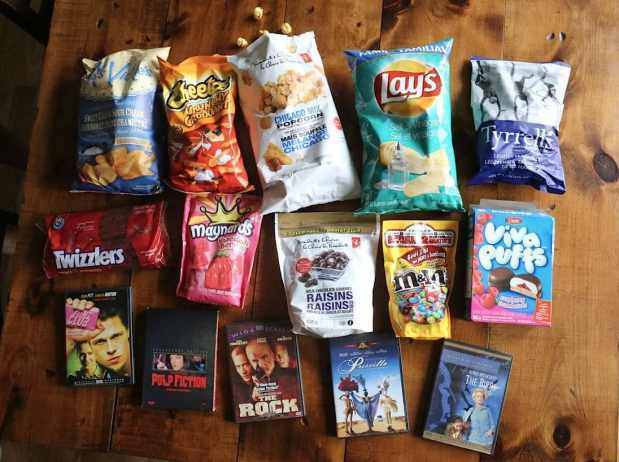 Once the kitchen is clean and the sun has peaked over the horizon gather your friends on a few comfy couches and indulge in a snack attack while watching a few classic films. Chicago Mix pairs well with Hitchcock’s The Birds while Pulp Fiction is best enjoyed with a bowl of Swedish Berries, Peanut M&M’s and fluffy raspberry filled Viva Puffs. For our final farewell feast I prepared a simple lunch with minimum clean up required. 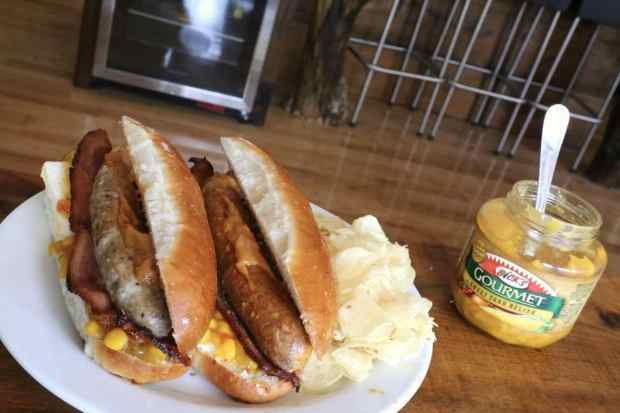 Sausage-fest featured two juicy options (berkshire pork or spicy chorizo) which were sandwiched between soft buns and and stuffed with aged cheddar, dijon mustard, crispy bacon, BBQ aioli and Bick’s Corn Relish. Grab a handful of your favourite potato chips, skip out onto the deck and devour your final moment in Muskoka as the wind whistles through plush pines. what a fun weekend! pickles are my favourite snack:)! glad you all enjoyed a great Muskoka weekend…..your memories of our cottage time as family on Mary’s Lake in Port Sydney and your choice of Viva Puffs, Miss Vickies Chips and Twizzlers brings back so many fond memories for me….so glad you enjoyed all the Muskoka experiences offered to you in your youth!! I would love to see you do another pirouette on the slalom waterskiis one of these summers!